1.5mm ThermaFlex™ Shorts with Duratex II™ reinforced seat, combining a comfortable and manoeuvrable fit. ProHike Pad compatible, with elasticated silicone backed binding at the leg cuffs and a tailored waist profile to support the positioning and overall fit of the shorts. The superstretch construction provides an unrestrictive layer of insulation in a functional length (just above the knee) perfect for summer adventures and warmer climes. Pair with our ThermaFlex™ Top for the ultimate combo. 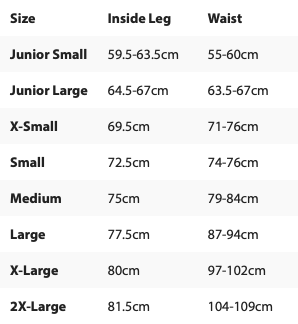 To use the size chart, find a size that best fits your inside leg and waist measurements. If you can't match both of these criteria, please take into account your body shape and choose the closest match.